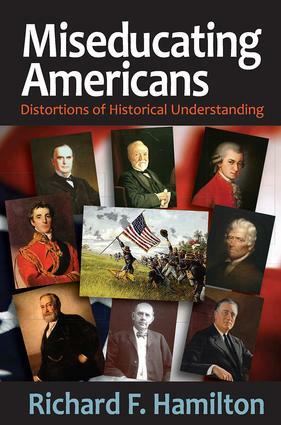 In Miseducating Americans, Richard F. Hamilton examines accounts of American history appearing in textbooks and popular accounts and compares these with the reports contained in scholarly monographs. The task: to determine how certain myths and misconstructions became accepted as recorded history. Hamilton provides much needed correction of those misleading accounts. Was America historically the "land of the free?" Not if you take into account slavery, discrimination, and post-Civil War segregation policies. Was America in the late nineteenth century truly expansionist, as American textbooks imply, or did it actually capitalize on unexpected political and economic opportunities, like Russia's desire to rid itself of Alaska? Was the acquisition of the Philippines a zealous profit-seeking effort aiming for "the China market," or the fortuitous consequences of a move against Spain during the Spanish-American War? Miseducating Americans debunks many commonly accepted explanations of historical facts. It contends that many accounts are oversimplifications, and some are one-sided depictions of virtue. Hamilton traces the sources of these misconstructions, which mostly come from history textbooks written by authors aiming for "popular audiences." He then offers explanations as to how and why the inaccuracies have been repeated and passed on.